Whether it’s an overnight stay or a three-week vacation, expectations for hotels have never been higher. Today’s travelers aren’t just looking for a place to crash after a long day of sightseeing, cuisine sampling, and souvenir hunting – they’re expecting a personalized, connected guest experience. Exceed the expectations of your guests and you’ll create a happy, loyal fan base. Fall short, and your hotel could draw negative reviews and face major issues. So, what’s the best way to ensure your hotel provides the perfect atmosphere for guests, draws rave reviews, and establishes a loyal customer base? Simple, provide a state-of-the-art hotel experience – and the easiest place to start is in the guest room. Personalization? There’s an app for that! As more and more daily experiences are shaped by technology, hotel guests expect connectivity everywhere they go. Travelers want to be able to check in on their tablet, key into the hotel room with their phone, and control every aspect of their experience with the touch of a button. This craving for connectivity has led to a wider adoption of IoT-enabled management solutions in many hotels. By integrating building management and guest room management systems and leveraging data from connected devices, tech-savvy hotel chains like Marriott, Hilton, and InterContinental Hotels offer mobile apps and in-room digital interfaces with a variety of personalization options. With the touch of a button guests can adjust their room temperature, open and close blinds/curtains, and adjust the room lighting to create the perfect atmosphere. While the end-user benefits of this technology create a fantastic guest experience, this same tech can be used to help hotels achieve massive energy savings and significantly improve operations. Here’s a quick example. Statistics show that guest rooms are unoccupied up to 70% of the time, yet room conditions (lighting, temperature, etc.) stay the same even if the room is vacant. Essentially, your hotel is using the same amount of energy in these rooms regardless of whether guests are present or out and about. Fortunately, our connected hotel solutions can help you eliminate these inefficiencies. By leveraging presence detectors and door status data, our solutions automatically detect room occupancy and optimize conditions accordingly. As I mentioned before, this automation can help your hotel significantly improve energy efficiency and sustainability. For instance, when the guest room is unrented or unoccupied, the curtains are automatically closed to mitigate solar heat gain and preserve furnishings. With rooms unoccupied such a large chunk of the time, this occupancy-based energy management can save a fortune in operating costs. Along with being tech-savvy, today’s hotel guests also care about the environment – specifically, how your hotel’s activities impact the environment. With 95% of business travelers expecting hotels to undertake ‘green’ initiatives, and programs like the TripAdvisors GreenLeaders, it’s clear that guests are demanding sustainability from hotels, and it’s getting easier for consumers to evaluate and compare just how green a hotel is. So, now that we’ve covered WHY the guest experience needs to be personalized, connected, and eco-friendly, you might be wondering HOW to implement this technology and WHO to rely on for expertise. By joining forces with shutter and blind control expert, Somfy, and heating control leader, Danfoss, we’ve created a Connectivity Ecosystem that can help your hotel drastically improve the guest experience and increase operational and energy efficiency. The partnership aims to accelerate the adoption of IoT solutions in hotels and other markets by natively integrating all devices and systems into a single guest room management platform. This significantly reduces installation and commissioning time, provides a single view of conditions in the guest room, and automatically saves energy based on occupancy and rental status. Best of all, it gives guests full control of their personal environment from a single app. Does automated efficiency and improved guest experience from a single solution sound possible? Download our Connected Hotel Solutions brochure to learn how our connected guest room solution can get you results! 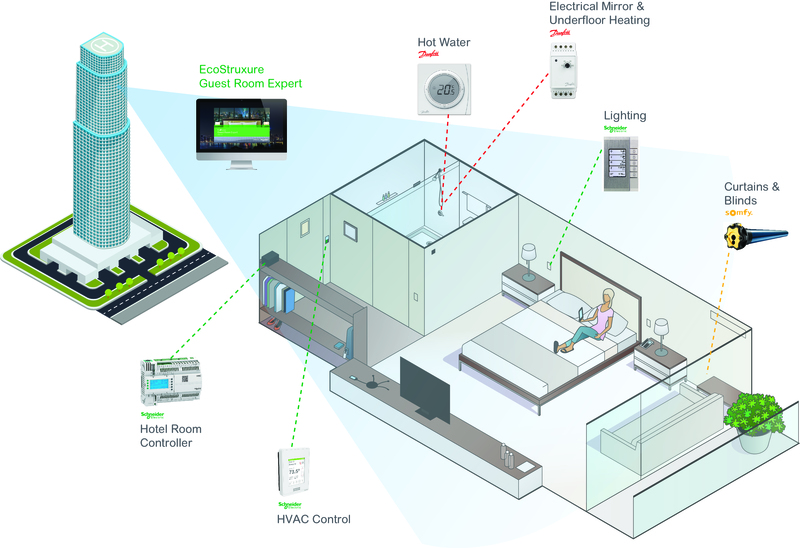 You can also explore Schneider Electric’s full portfolio of hotel solutions.